Daydreaming of sun kissed beaches and laid back island life? Check out our Honolulu travel guide, featuring the best time to visit, before you book your next international holiday! Home to close to one million people, Honolulu, the Hawaiian state capital, is situated on the island of Oahu, within the Hawaiian archipelago. One of the United States of America’s fifty states, Hawaii is located within the Pacific Ocean and is the northernmost group of islands within the Polynesian region. The island on which Honolulu sits, Oahu, can be found in the north of the archipelago, with the city itself found in Oahu’s south. Drawing together spectacular natural beauty, a unique culture of its own and a tumultuous history that spans hundreds of years, Honolulu is a city that certainly packs a punch. Whether you only have a few days to explore or are wanting to discover what it is that makes this part of the world so incredibly special, Honolulu offers countless opportunities to learn more about the authentic Hawaiian way of life, the city’s modern incarnation and the beauty that abounds in this corner of the globe. Located relatively close to the equator, Honolulu’s average temperature does not vary greatly between the seasons, meaning that you can visit at any time of the year. Although the average daily high sits at around 29℃ all year round, there are some changes in weather conditions that you can expect at different times of the year. Winter in Honolulu, for example, can be quite rainy, while summer is typically dry. 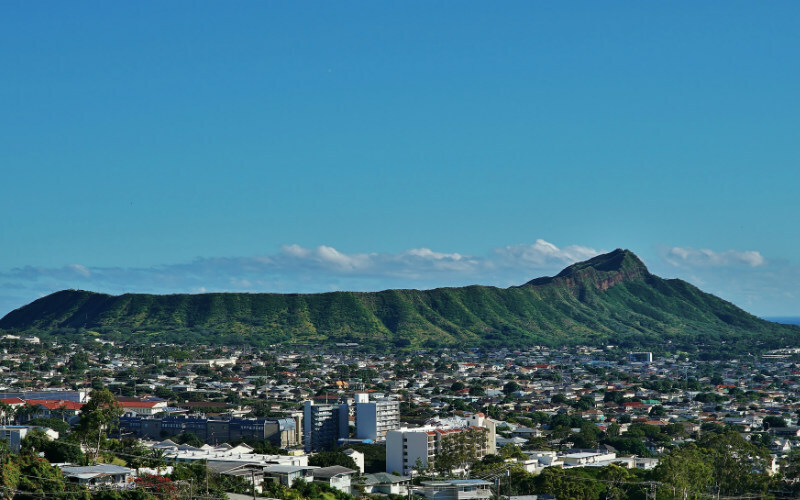 Coinciding with the European winter and the Christmas holiday period, Honolulu’s winter (December to March) is generally the city’s peak season, leading to an increase in flight costs and hotel rates, so it is best to travel outside this period if possible. The drier months of April to October are often quieter than the peak season, meaning that you may be able to travel further for less, but the time from May to August can be rather humid. As a general rule of thumb, it is often best to book international flights around three months before you plan to travel to find the best prices and availability. As the best time to visit Honolulu falls between April and October, you should look to find, compare and book your flights between January and July. 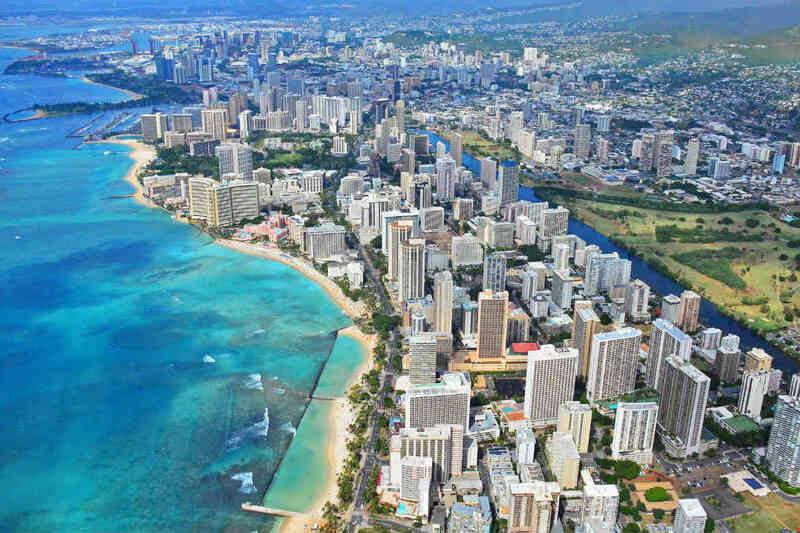 When is the most expensive time to visit Honolulu? Coinciding with the European and North American winters, as well as the Christmas and New Years break, Honolulu’s high season falls between December and March. Attracting holidaymakers from all corners of the globe, it is at this time that the city experiences the highest prices and demand for accommodation and flights. This time of year also happens to be one of the most popular for surfing enthusiasts, with board riders from around the world flocking to the city’s shores to make the most of its world renowned swells. Diamond Head, Honolulu, Hawaii. Image Credit: Eric Tessmer / CC by 2.0. What is there to do in Honolulu? When you think of Hawaii, it’s likely that an image of sun kissed beaches and sparkling waters comes to mind. Situated on the southern edge of the island of Oahu, Honolulu certainly has no shortage of fantastic waterside spots to discover. 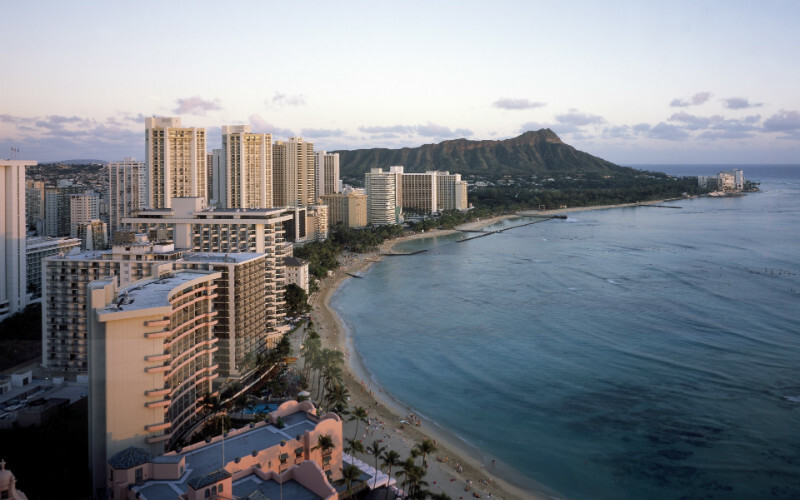 Perhaps one of the Hawaii’s best known beaches, Waikiki Beach is also one of the most popular and has been a spot loved by locals and visitors alike for decades. Comprised of several sandy stretches connected by a boardwalk, the beach boasts great swimming and surfing conditions all year round, and hosts a great range of other activities including volleyball, stand-up paddleboarding and more. If you’d rather avoid the crowds, there are a few other great swimming spots located on either side of Waikiki. 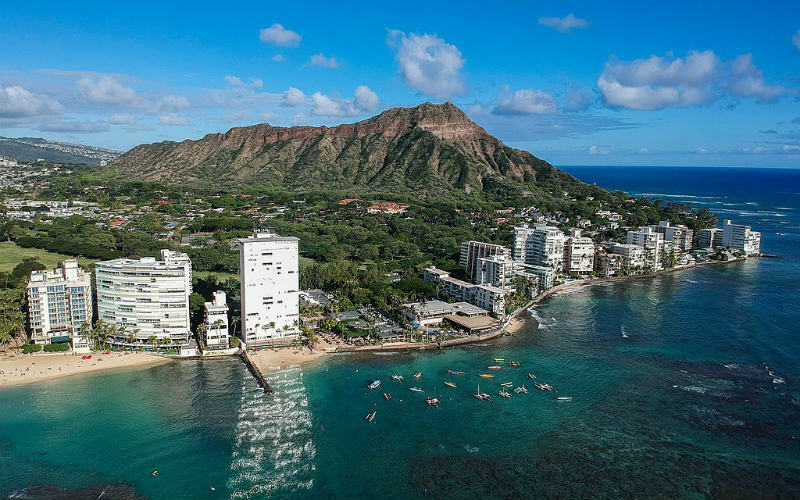 To the north, you’ll find Ala Moana Beach Park, which offers picnic facilities, recreational areas and family-friendly conditions, while in the south, Kaimana Beach is another great the place to head with the family in tow, complete with bathrooms, showers and a lifeguard patrol. Beyond its spectacular natural assets, Honolulu is also home to a thriving arts scene. If you have an interest in the creative arts or simply looking to explore another side of this fascinating city, set aside time to explore what makes the local arts scene so special. A great place to start is the Honolulu Museum of Art, which houses a permanent collection of over 50,000 works from across America, Asia and Europe, with a focus on pieces originating from Hawaii. Wander through the galleries or hone your skills with one of the many classes on offer, including drawing, painting and jewellery making. For something a little different, make your way to the Shangri La Museum of Islamic Art, Culture and Design, which happens to be home to one of the world’s largest collections of Islamic art. Set within an architecturally stunning building, the museum showcases ornate and captivating works from across Europe, the Middle East, and beyond. If you have some free time to explore the city’s streets, keep an eye out for the incredible street art that decorates the sides of buildings, as well as independent galleries such as the Peter Lik Gallery, Nohea Gallery and the Andrew Rose Gallery. Downtown Honolulu, Hawaii. Image Credit: Edmund Garman / CC by 2.0. Combining flavours originating from all corners of the globe, Honolulu’s dining scene is exciting, diverse and sure to leave you wanting more. From casual eats through to fine dining, great dishes to match almost every budget and taste are available from the city’s cafes, restaurants and eateries. Whether you’re craving Japanese, Mediterranean or something authentically American, the wide variety of international cuisines on offer will leave your taste buds well and truly satisfied. Be sure to set aside some time and space in your stomach to try an iconic bowl of poke (seasoned sashimi served on a bed of rice), enjoy a taste of colourful shave ice and to sink your teeth into some delicious Japanese-inspired dishes. The sun can be quite harsh in Honolulu, so if you’re planning to spend time outside or lazing on one of the beaches surrounding the city, it is best to take a few steps to take care of your skin. There are a wide variety of sun protection options available, but some of the easiest include applying sunscreen, wearing a hat and sunglasses, and seeking shade. Keep an eye out for rental beach umbrellas which not only offer great sun protection but will look great in your holiday snaps. 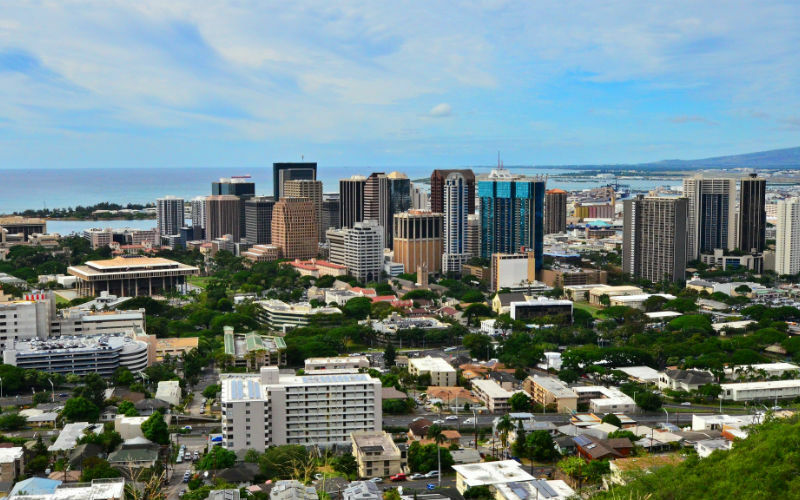 Compared to other cities around the world, Honolulu is generally a pretty safe destination. This being said, it is always best to be aware of your surroundings, especially if you find yourself walking through the city’s streets after dark. If you plan to rent a car during your visit, do take care to ensure that you do not leave any valuables in plain sight. As with any country around the world, leaving valuables in plain sight could tempt thieves to break into your vehicle, leaving you without your belongings and with unwanted expenses. Around Honolulu you’ll find a number of spectacular waterside spots, but, unfortunately, not all are patrolled by lifeguards. If you are thinking of taking a swim at one of Oahu’s unpatrolled beaches, be sure to take notice of the tides and currents and avoid heading far from the shore if you aren’t completely confident with the conditions. Honolulu, Hawaii. Image Credit: Anthony Quintano / CC by 2.0. Ready to experience the beauty and culture of Honolulu? Find and compare cheap flights to Honolulu with Webjet today! Feature Image Credit: Edmund Garman / CC by 2.0.